Wowzers! That~s a fine solid polo you~ve got there. Rock it well, in rad Volcom style. Cotton knit has a soft hand for all-day comfort. Polo-style collar. Three-button placket. Asymmetric back yoke. Hemmed short sleeves. Embroidered logo at left chest. 100 percent cotton. Machine wash cold, tumble dry low. Imported. Measurements: Length: 21 in Product measurements were taken using size MD (10-12 Big Kids). Please note that measurements may vary by size. 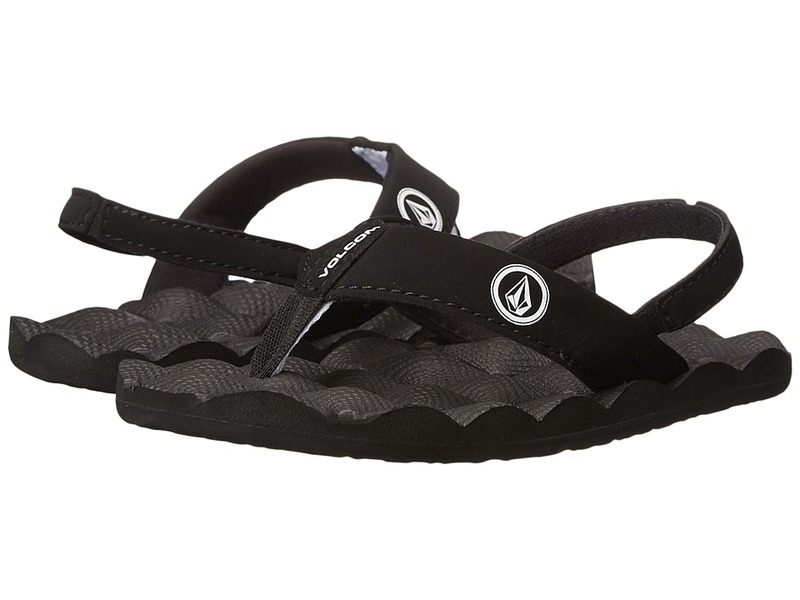 Keep your little dude comfy and styling with the cool Volcom Recliner sandal! Polyurethane ultra suede straps for incredible durability. Heel accent EVA strap. Logo detailing adorns strap. Quilted rubber sponge sole with a molded EVA footbed for superior comfort. Rubber outsole with logo tread. Imported. Measurements: Weight: 2 oz Product measurements were taken using size 10 Toddler, width M. Please note that measurements may vary by size. Weight of footwear is based on a single item, not a pair. 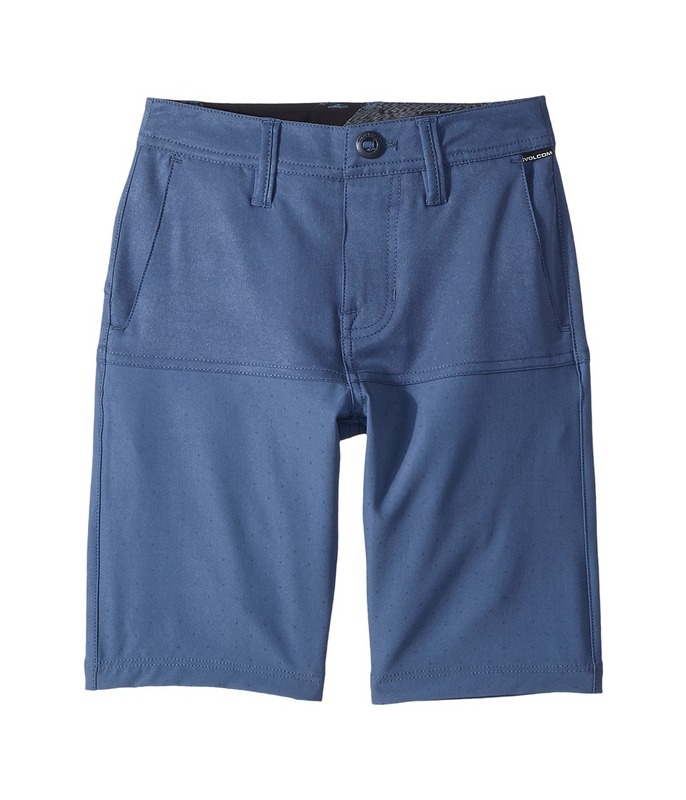 Street-ready style in a quick-dry fabric means this shorts can handle anything the day brings, wet or dry. 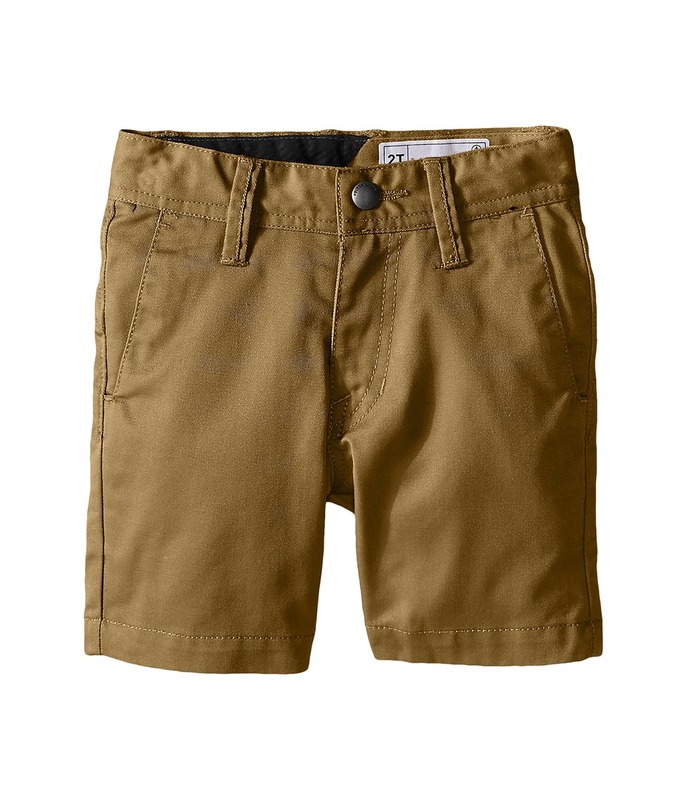 Chino-designed shorts. Fixed waist with belt loops. Button closure and zip fly. 85 percent polyester, 9 percent cotton, 6 percent elastane. Machine wash cold, tumble dry low. Imported. Measurements: Waist Measurement: 20 in Outseam: 10 in Inseam: 3 1 2 in Front Rise: 7 in Back Rise: 10 in Leg Opening: 14 in Product measurements were taken using size 2T Toddler. Please note that measurements may vary by size. 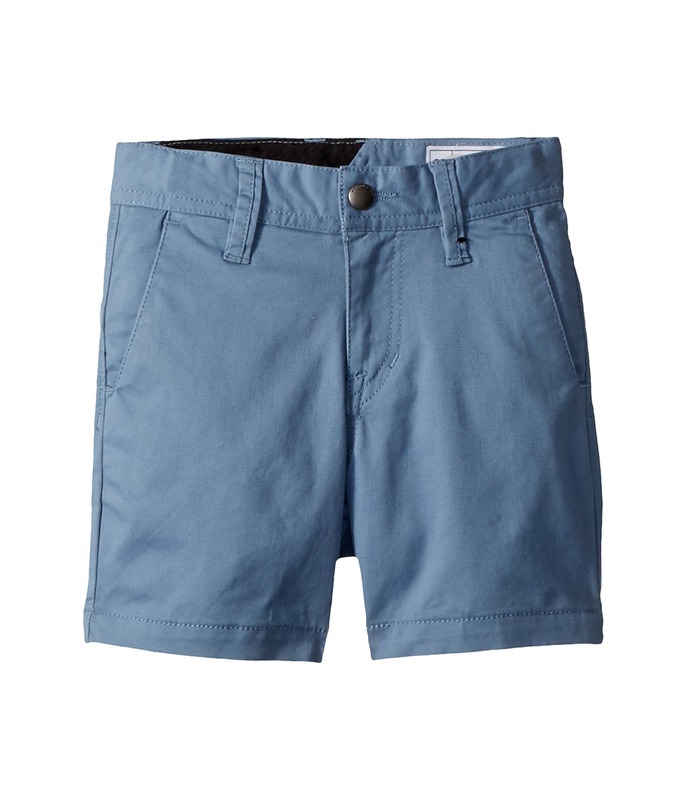 A lightweight pair of shorts with a broken in street style look. A modern fit that wears slightly slim for a more polished presentation. Belt-loop waistband. Zip fly with button closure. Two hand pockets. Welt pockets in back with button closure on left. Asymmetrical seam accent in back. Branding at back right pocket on the back left leg. 95 percent cotton, 5 percent elastane. Machine wash, tumble dry. Imported. Measurements: Waist Measurement: 27 in Outseam: 17 1 2 in Inseam: 8 1 4 in Front Rise: 9 in Back Rise: 11 1 2 in Leg Opening: 16 in Product measurements were taken using size 27 (14 Big Kids). Please note that measurements may vary by size. A lightweight pair of shorts with a broken in street style look. A modern fit that wears slightly slim for a more polished presentation. Belt-loop waistband. Zip fly with button closure. Two hand pockets. Welt pockets in back with button closure on left. Asymmetrical seam accent in back. Branding at back right pocket on the back left leg. 98 percent cotton, 2 percent elastane. Machine wash, tumble dry. Imported. Measurements: Waist Measurement: 19 in Outseam: 11 in Inseam: 4 in Front Rise: 7 1 2 in Back Rise: 10 1 4 in Leg Opening: 14 in Product measurements were taken using size 2T. Please note that measurements may vary by size. 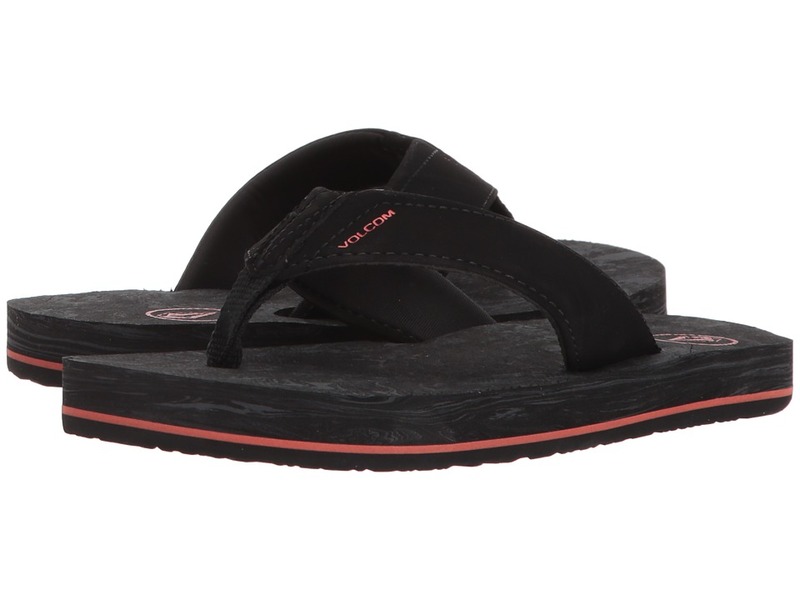 The Volcom Kids Victor is a winning flip flop for indoor or outdoor wear! Features a polyurethane nubuck upper. Lycra-lined upper for added comfort. Webbing toe post. Cold press RCF molded EVA sole for all-day wear. Non-scuff molded rubber outsole. Imported. Measurements: Weight: 3 oz Product measurements were taken using size 2 Little Kid, width M. Please note that measurements may vary by size. Weight of footwear is based on a single item, not a pair. 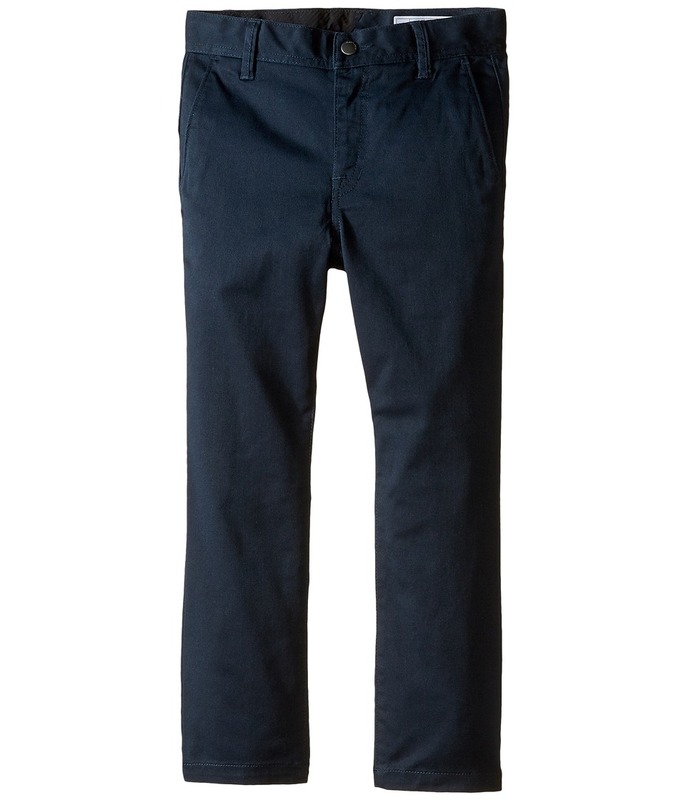 Stop frickin~ around and cop these legit chino pants before your swagger gets taken off life support. Durable tri-blend fabric with a slight stretch provides for a more comfortable wear. Belt loop waist. Zip fly with button closure. Side hand pockets. Back welt pockets. Asymmetrical back yoke. Brand logo at inner left leg and back right pocket. Volcom label at back right pocket. 59 percent cotton, 39 percent polyester, 2 percent elastane. Machine wash cold, tumble dry low. Imported. Measurements: Waist Measurement: 24 in Outseam: 31 in Inseam: 22 3 4 in Front Rise: 8 3 4 in Back Rise: 11 in Leg Opening: 13 in Product measurements were taken using size 22 (8 Slim Big Kids). Please note that measurements may vary by size. 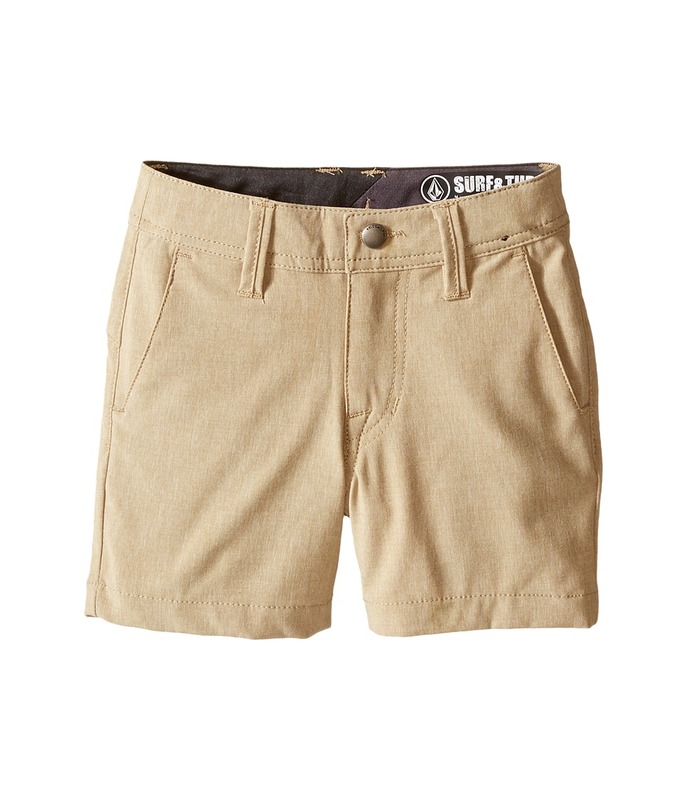 Classic, comfortable must-have addition to his summer wardrobe. Belt-loop waistband with inside waist adjusters for the perfect fit. Zip and snap fly closure. Two front slant pockets for handy snack storage. Winking back welt pockets. Drop-in media pocket at right. Logo detail on inner left leg. 65 percent polyester, 35 percent cotton. Machine wash cold, tumble dry low. Imported. Measurements: Waist Measurement: 12 1 4 in Outseam: 16 in Inseam: 7 3 4 in Front Rise: 9 1 2 in Back Rise: 12 1 4 in Leg Opening: 16 in Product measurements were taken using size 2XL (7X Little Kids). Please note that measurements may vary by size. 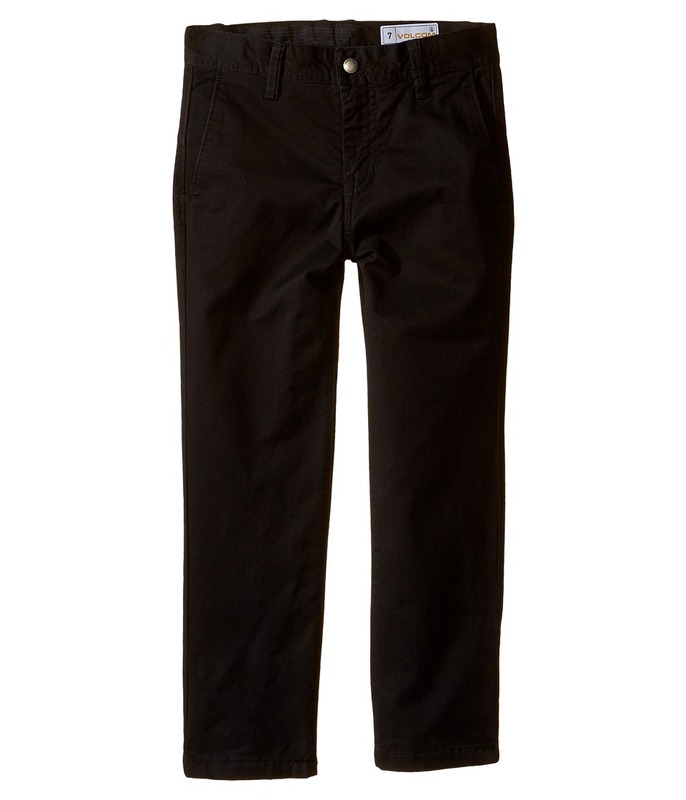 Stop frickin~ around and cop these legit chino pants before your swagger gets taken off life support. Durable tri-blend fabric with a slight stretch provides for a more comfortable wear. Belt loop waist. Zip fly with button closure. Side hand pockets. Back welt pockets. Asymmetrical back yoke. Brand logo at inner left leg and back right pocket. Volcom label at back right pocket. 59 percent cotton, 39 percent polyester, 2 percent elastane. Machine wash cold, tumble dry low. Imported. Measurements: Waist Measurement: 23 in Outseam: 26 1 2 in Inseam: 18 in Front Rise: 8 1 2 in Back Rise: 11 in Leg Opening: 12 1 2 in Product measurements were taken using size LG (6 Little Kids). Please note that measurements may vary by size. 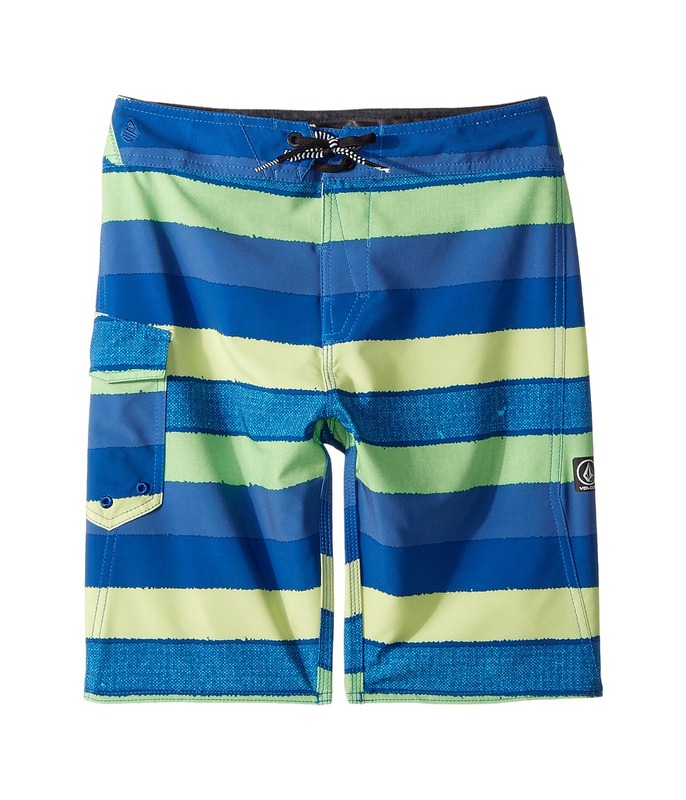 These Volcom boardshorts are a solid choice for when you~re out thrashin~. Quick-drying 4-way stretch material keeps you feeling like a boss on the waves. Front tie closure with Cinch Fly. 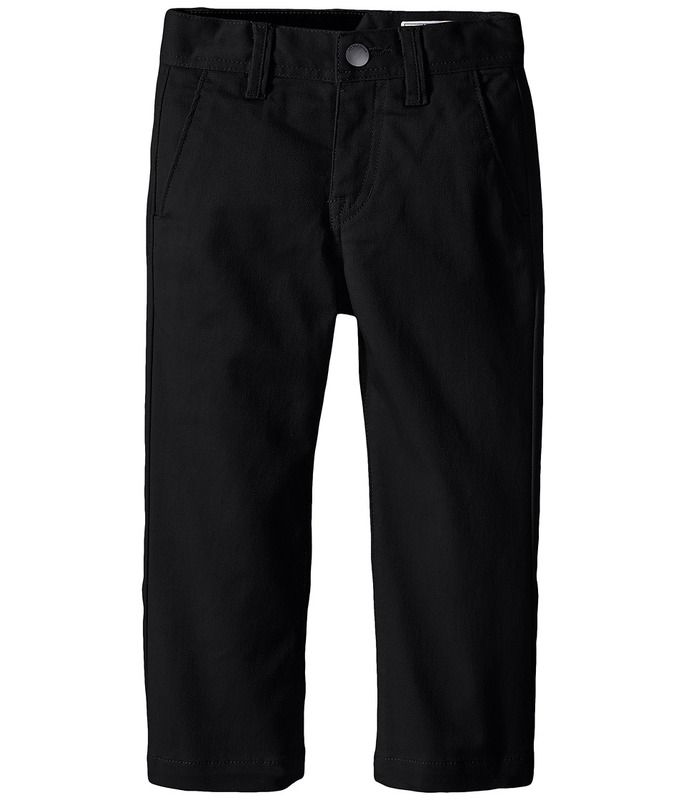 Cargo pocket with drainage eyelets at right leg. 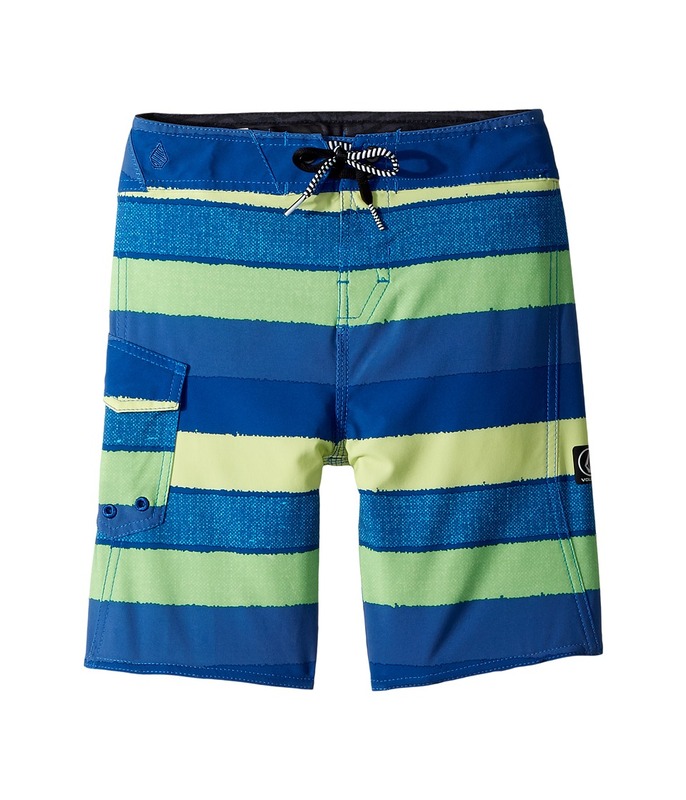 Volcom brand markings at front left leg and side pocket. 46 percent polyester, 46 percent recycled polyester, 8 percent elastane. Machine wash cold, tumble dry low. Imported. Measurements: Waist Measurement: 31 in Outseam: 20 in Inseam: 10 in Front Rise: 10 1 2 in Back Rise: 13 1 2 in Leg Opening: 20 in Product measurements were taken using size 30 (20 Big Kids). Please note that measurements may vary by size. If you~re not fully satisfied with your purchase, you are welcome to return any unworn and unwashed items with tags intact and original packaging included. 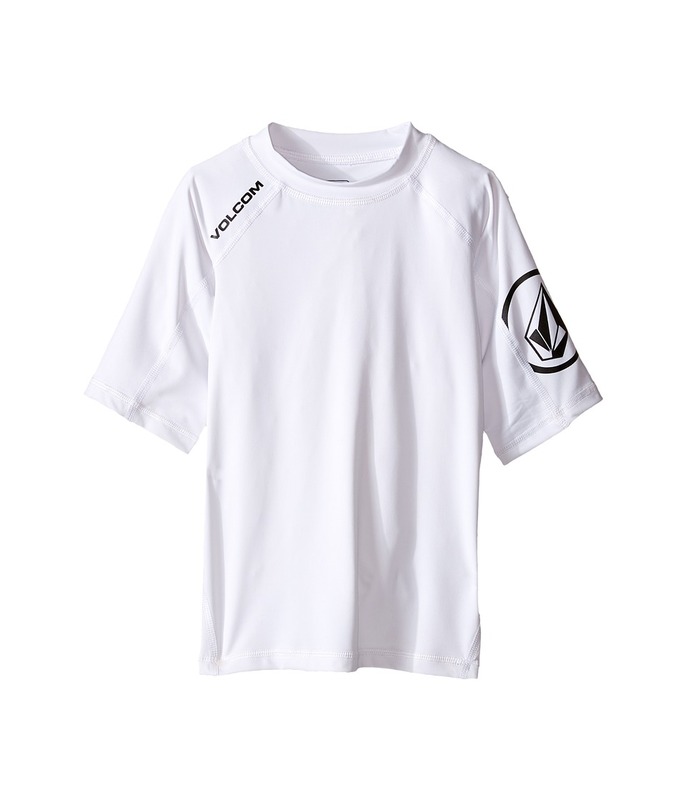 You~ll look fresh no matter what the scene with the Volcom Kids Lock Up S/S Thrashguard. Rashguard is made with quick-dry material to keep you comfortable in and out of the water. Athletic fit. Ultraviolet protected fabric for sun safety and increased range of motion. 30+ UV protection. Logo screen prints throughout. Crew neck. Raglan sleeves eliminate shoulder seam chafing. Short sleeves. 85 percent polyester, 15 percent elastane. Hand wash, line dry. Imported. Measurements: Length: 21 1 4 in Chest Measurement: 14 in Sleeve Length: 11 1 2 in Product measurements were taken using size LG (14-16 Big Kids). Please note that measurements may vary by size. If you~re not fully satisfied with your purchase, you are welcome to return any unworn and unwashed items with tags intact and original packaging included. 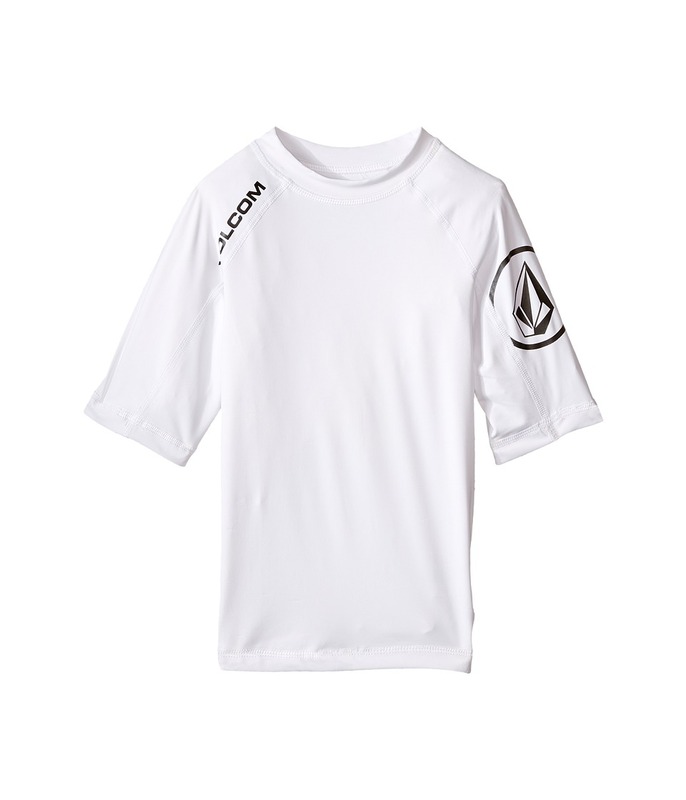 Get outside and have some fun in this Volcom surf shirt. Quick-dry construction provides all-day comfort. Banded crew neckline. Relaxed fit. Short sleeves. Straight hem. 85 percent polyester, 15 percent elastane. Machine wash cold, tumble dry low. Imported. Measurements: Length: 12 1 4 in Product measurements were taken using size 2T. Please note that measurements may vary by size. If you~re not fully satisfied with your purchase, you are welcome to return any unworn and unwashed items with tags intact and original packaging included. 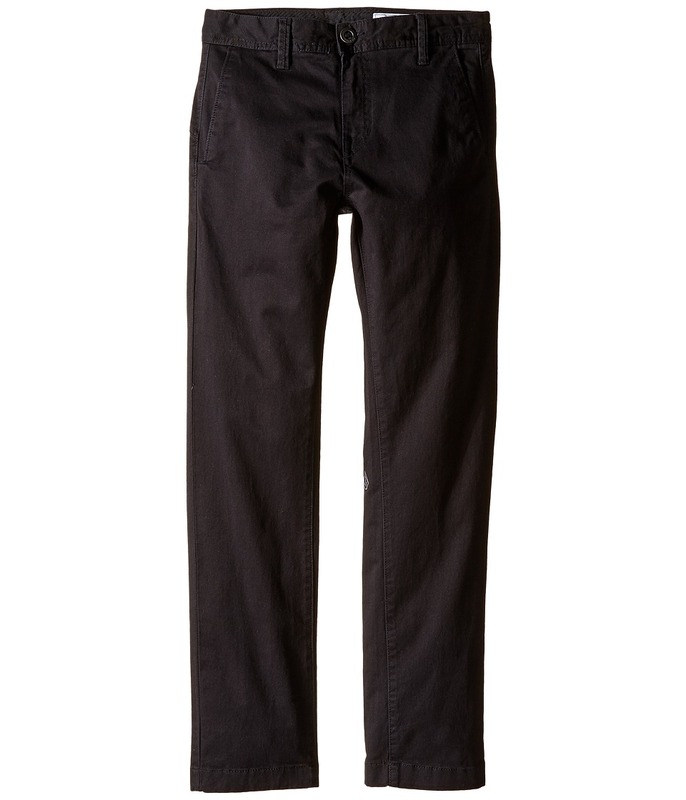 You~re frickin~ awesome in these fresh and fly stretch pants. 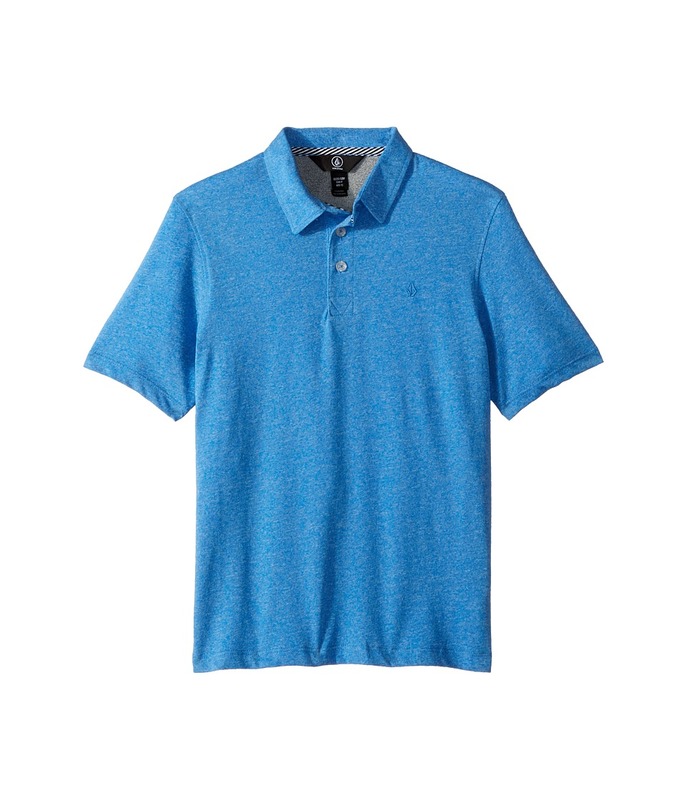 Soft cotton fabric provides a little stretch for added comfort and durability. Slim fit through the hips and thighs. Tapers in slightly at the leg opening. Belt loop waistband. Zip fly with button closure. Side hand pockets. Back welt pockets. Asymmetrical back yoke. 99 percent cotton, 1 percent elastane. Machine wash cold, tumble dry low. Imported. Measurements: Waist Measurement: 32 in Outseam: 38 1 2 in Inseam: 28 1 2 in Front Rise: 10 in Back Rise: 13 in Leg Opening: 14 in Product measurements were taken using size 30 (20 Big Kids). Please note that measurements may vary by size. Stretchy, skate ready pants that~ll keep up with you no matter what you put them through! Belt loop waistband. Zip fly with button closure. Slant pockets in the front. Welt pockets in back with a button closure on the left pocket. Signature asymmetrical stitching on back. Brand label above right pocket in back. Stitch logo on left leg near the knee in back. 59 percent cotton, 39 percent polyester, 2 percent elastane. Machine wash, tumble dry. Imported. Measurements: Waist Measurement: 24 in Outseam: 28 in Inseam: 19 1 2 in Front Rise: 9 in Back Rise: 11 in Leg Opening: 12 in Product measurements were taken using size XL (7 Little Kids). Please note that measurements may vary by size. You~re frickin~ awesome in these fresh and fly stretch pants. 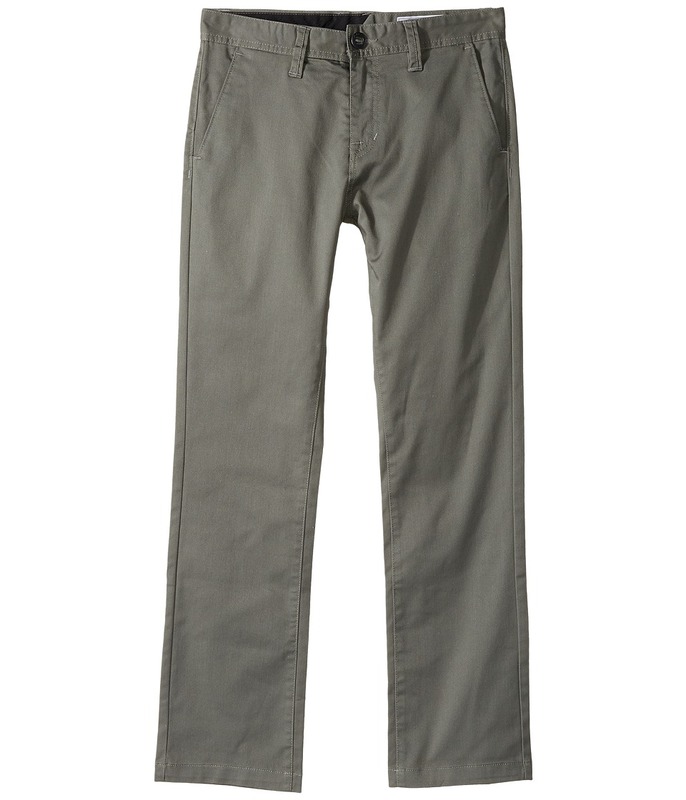 Soft cotton fabric provides a little stretch for added comfort and durability. Slim fit through the hips and thighs. Tapers in slightly at the leg opening. Belt loop waistband. Zip fly with button closure. Side hand pockets. Back welt pockets. Asymmetrical back yoke. 99 percent cotton, 1 percent elastane. Machine wash cold, tumble dry low. Imported. Measurements: Waist Measurement: 25 in Outseam: 28 in Inseam: 20 in Front Rise: 8 1 2 in Back Rise: 11 in Leg Opening: 12 in Product measurements were taken using size XL (7 Little Kids). Please note that measurements may vary by size. Kick out of the pipe in style! Fitted waistband. Hook-and-loop fly with faux draw string. Patch pocket with hook-and-loop closure and water drain holes on left leg. All-over stripe pattern. Patch with logo and branding on left leg. 93 percent polyester, 7 percent elastane. Machine wash, tumble dry. Imported. Measurements: Waist Measurement: 36 in Outseam: 20 in Inseam: 10 in Front Rise: 11 in Back Rise: 13 in Leg Opening: 9 1 2 in Product measurements were taken using size 30 (20 Big Kids). Please note that measurements may vary by size. If you~re not fully satisfied with your purchase, you are welcome to return any unworn and unwashed items with tags intact and original packaging included. 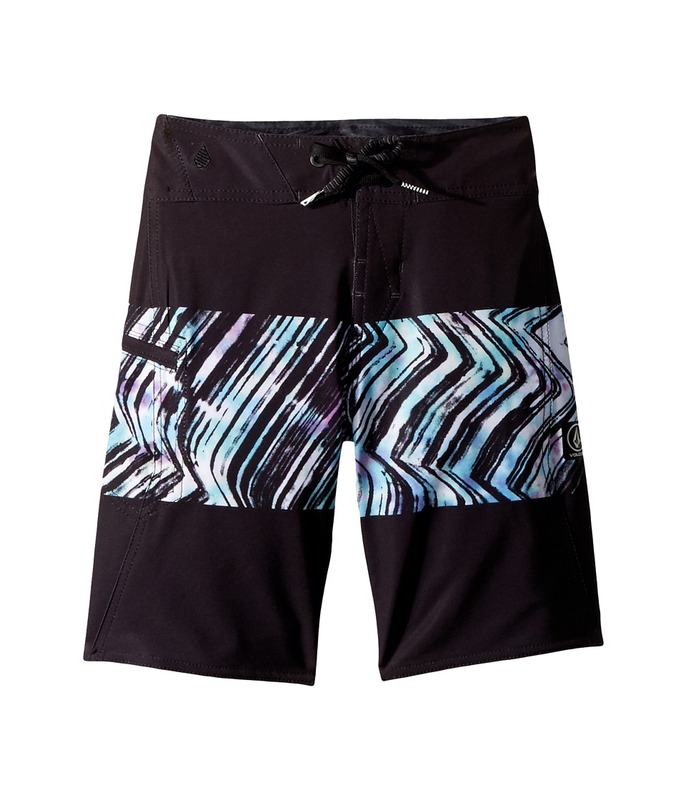 Hang ten in style with these board shorts from Volcom! Fitted elastic waistband. Hook-and-loop fly with faux draw string. Patch pocket with hook-and-loop closure and water drains. Logo branding on right waistband, left leg, and on the pocket. Multi-color horizontal stripe pattern. 93 percent polyester, 7 percent elastane. Machine wash, tumble dry. Imported. Measurements: Waist Measurement: 12 1 2 in Outseam: 16 in Inseam: 7 1 2 in Front Rise: 16 in Back Rise: 12 1 2 in Leg Opening: 9 3 4 in Product measurements were taken using size XL (7 Little Kids). Please note that measurements may vary by size. If you~re not fully satisfied with your purchase, you are welcome to return any unworn and unwashed items with tags intact and original packaging included. Skate through the streets in style with the Frickin SNT Block Shorts! 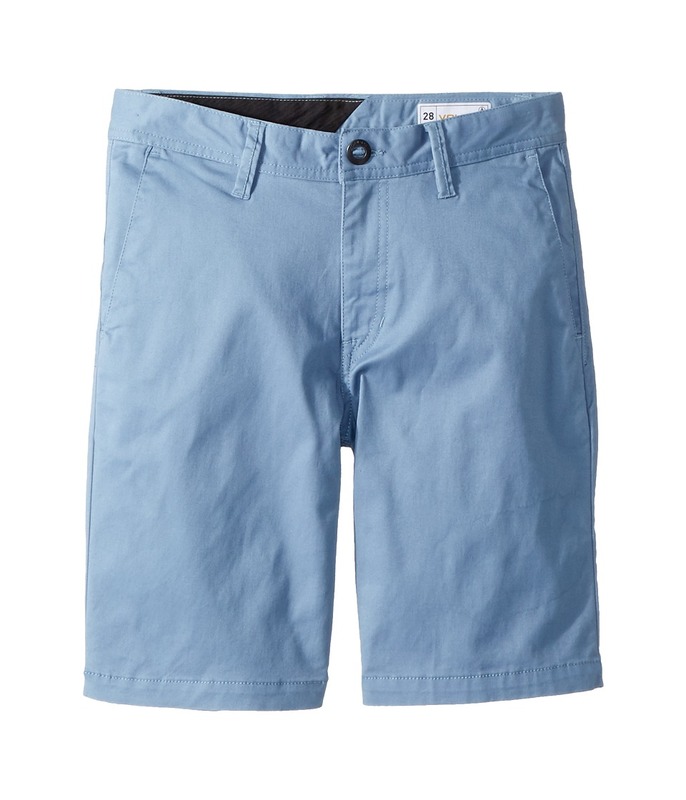 Color-blocked shorts feature a soft cotton-poly blend for all day comfort. Belt-loop waistband. Zip fly with button closure. Four-pocket construction with button-closure at back left. Short cuffs. Logo hit at back right. Top Panel: 72 percent polyester, 22 percent cotton, 6 percent elastane Bottom panel: 90 percent polyester, 7 percent elastane, 3 percent other fibers. Machine wash, tumble dry. Imported. Measurements: Waist Measurement: 26 1 2 in Outseam: 28 1 4 in Inseam: 9 in Front Rise: 11 in Back Rise: 13 in Leg Opening: 9 in Product measurements were taken using size 26 (12 Big Kids), inseam 18. Please note that measurements may vary by size.